Mansions, designer clothes and fancy cars aren’t the only possessions that set rich people apart from the rest of society. The one thing that really distinguishes the wealthy is their ability to seize any opportunity and convert it into financial success. Have you always wanted to get rich? 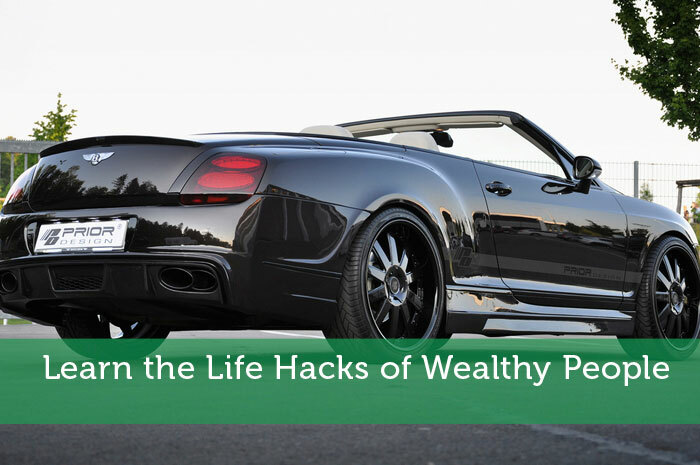 Here are some life hacks of wealthy people you can learn. Having the courage to take a risk is often what got the wealthiest members of society rich in the first place. Banishing your fear of failure is a life hack that can be applied to any endeavour, but it is particularly relevant in the context of business and wealth. After all, some of the richest people in the world where once told they would never make it. If you’ve been thinking of taking a taking a chance on a new business venture, don’t allow prospect of failure to hold you back from potentially achieving financial success. Continuously learning new skills and challenging yourself is something that people at the top take seriously. Whether it be learning a language, trying a new sport or staying on top of the latest developments in your industry, this is a sure-fire way to keep your body and mind active. Your newfound education can even help you become wealthier. For example, organisations such as Learn to Trade offer Forex Trading Courses, allowing students to potentially earn a secondary income and learn at the same time. Are you careful with how and where your earnings are spent? If is often assumed rich people are complacent with their money, and that they are willing to spend hundreds of thousands of dollars on a whim. However, despite having more money than the average person, many wealthy people are often extremely careful with their fortune. By keeping a close eye on their finances at all times, they can keep absolute control over their spending, securing their elevated financial status. Whether you engage with the services of an accountant or simply review your bank accounts more often, never losing track of your money is a challenge you should embrace with enthusiasm. Wealthy people know that making long-term plans is a guaranteed method of securing financial freedom. Imagine if every wealthy person went on a spending spree the second they made their first million; there’d be a lot less millionaires in the world today, that’s for certain. Investing wisely and preparing for the future is more than just a life hack; it’s a strategy that can secure an affluent lifestyle for you and your family for years to come. Every financial decision you make today could end up having a significant impact on your long-term wealth. Rich people simply look at the world from a different perspective, allowing them to reach levels of financial freedom most people have never even dreamt of. Do you know of any other life hacks of the wealthy? Share your thoughts in the comments below. These are all great. It seems the wealthy have really hacked life and planning for the future is so important. If we don’t plan for it, who will? This is a very interested read, and I enjoy reading through the different points suggested in how wealthy people succeed. One point that really stood out while I was reading was that they continue to learn. Through the years they continue to learn, but one thing is interested they don’t try to do it all themselves. Most of the wealthiest people I know are not the true DIY people. Simple usefull points but could be dangerous if people don’t know how to gauge the risks they’re taken for #1. The rest are solid though!